We’re proud to have San Jose based Cukui Clothing as our official battle shirt sponsor this year, the design is definitely setting the bar for years to come. Artists competing in each battle have been provided Cukui gear to rock during the competition. Orly Locquiao and the design team behind Cukui including Samuel Rodriguez, Isaac Helm and David Pham all met through graffiti back in the mid-90s. It became the foundation of them as artists and stemmed to what they do now including running a tattoo shop, a screen printing company and being independent graphic designers. 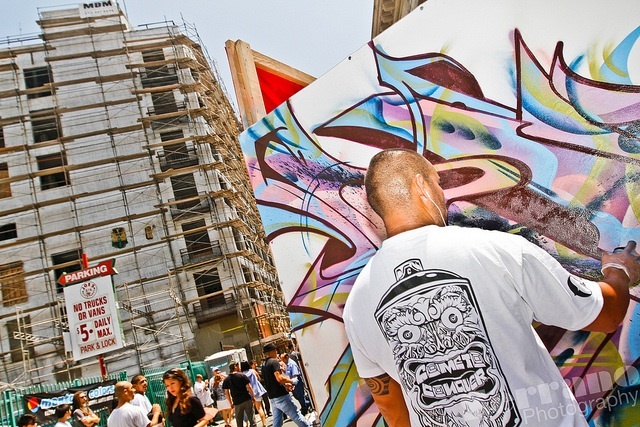 Cukui is a product of the artists’ individual styles and would not be what it is without their roots in graffiti. Cukui chose to collaborate with the Estria battle because of the positive light it puts graffiti in. To most people, it may be seen as vandalism and an act of being rebellious and what the Estria battle is doing is involving the youth and creating art projects across the country. Cukui hopes that its graphic tees and art gallery is an inspiration to the community and that art can lead to a rewarding and humbling career. Cukui and the Estria battle are both part of this movement in making dreams out of art. You can now make your purchase at their San Jose location or online here. These limited edition tees will also be available at the Battle Finals in Oakland, CA, Saturday October 8, 2011.